The tablet segment is buzzing with activity. Not that it had gone into the hibernation mode but for a while it was the Android tablets that were found hogging the limelight with the biggies in the business seemingly having no qualms taking the back seat. But that has changed and the latest that we get to hear are some ambitious tablet plans from Asus. The Taiwan based company had already revealed they would aim to register a sizeable presence in the tablet segment and has just come out with further details outlining their game plan. Asus CEO Jerry Shen has come out with the specific price of three tablet devices that it plans to launch in the December January time slot while also mentioning there is an Android powered tablet in the pipeline as well which is slated to go on sale during March next year. The costliest of the lot is the Asus Eee Pad EP121 which will cost a quite staggering $1000. Justifying the high price is the 12.1-inch sized touchscreen upfront while beneath it will be an Intel Core Duo ULV processor running Windows 7 Home Premium. There are also reports that the Eee Pad EP121 will include a docking station as well that will transform the tablet into a laptop, something that’s also evident in the Lenovo U1 hybrid design. In fact, it is the ability of the EP121 to take up all the functionality of a full desktop computer that has resulted in it being priced a rather high $1000. Up next is the 10 inch screen sized Eee Pad sporting the conventional tablet form factor and has been priced between $399 and $499. This is the other tablet that will make it to the markets sometime in December and January and will have the Windows Embedded Compact 7 as the operating system. It was not too long ago that it was rumored the Google’s Android has come to replace the Windows OS in the 10 inch tablet but with the latest announcement from none other than the Asus CEO, it now seems certain the Windows OS has prevailed. And lastly, Asus has also jumped into the Android tablet bandwagon as is perhaps the craze right now, announcing there is going to be an Android flavored tablet as well that will be ready towards the first quarter of 2011. The Android powered tablet will also be priced at a quite affordable $399 and will run the latest Gingerbread version of the operating system. In fact, Asus is reported to have increased the headcount of engineers working on the Android tablet by bringing in several from the smartphone team, which shows they are really keen to come up with the Android tablet with the stipulated deadline. So, here is one more to come up with specific launch times and prices. Samsung had also earlier revealed they will be launching the Galaxy Tab next month with Notion Ink too coming up with price and launch specifics. The tablet segment is surely hot right now but is set to become ever hotter. Keep watching as we catch all the excitement as it happens. 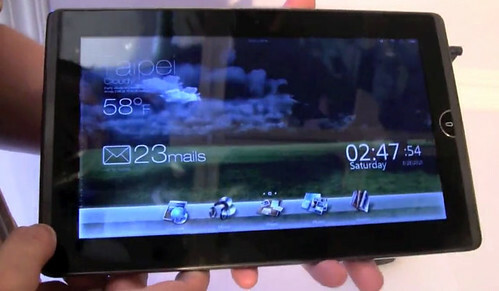 PS: The picture shown above is that of the Asus Eee Pad EP121 tablet.